Mountain Resort Retreat - Great Views - Superb Location! This comfortable condominium is beautifully furnished with mountain rustic furniture and is located at the base of Canyons Village, part of Park City, the country's largest ski resort. 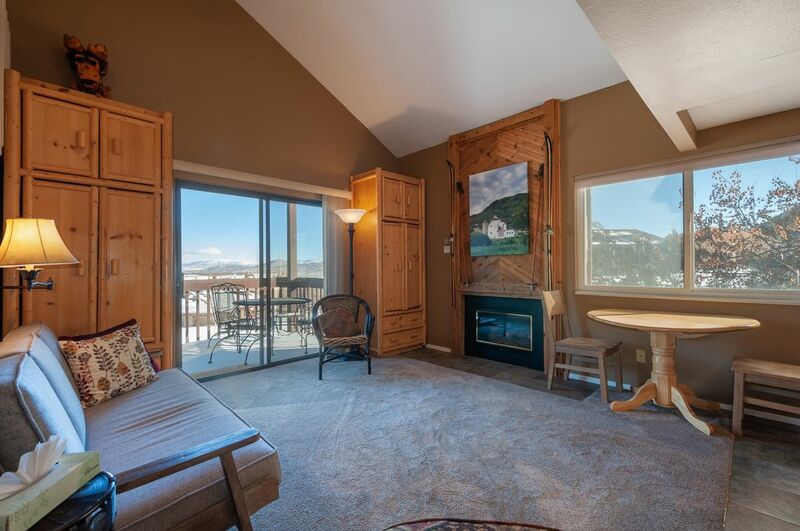 You will feel right at home in our comfortable condo with its lovely views and proximity to the ski lifts. The full-size washer and dryer add great convenience. The master bedroom has a king bed, the upstairs bedroom has two sets of bunkbeds, and a secluded loft has a queen bed. The king and queen beds have euro-top mattresses. There are two full bathrooms and lots of storage. Our unit has many recent updates, including new full-size washer and dryer, new quartz counters, new carpet, new sofa, new dishwasher, new glass-top stove, new flat-screen television, and new microwave. The kitchen is designed and stocked for the cook. A breakfast bar and dining room table will make meals enjoyable for family and friends. The cozy gas fireplace is perfect to come home to after a day on the slopes. Game boards, videos, DVDs, cards, and books are provided for your use. For the comfort of all our guests, this is a non-smoking, no-pet accommodation. Our complex is quiet, well maintained, and secured. The clubhouse features two full-size pools (one heated in the winter and the other with a summer waterfall), one kiddie pool, an indoor Jacuzzi, an outdoor Jacuzzi, a sauna, four tennis courts, and a volleyball area. Historic Park City is just 2.5 miles from the complex, with unique restaurants and shopping. Just one mile north is the Winter Sports Park from the 2002 Olympics. Redstone, Park City's newest grocery, retail and restaurant area, and the Tanger factory outlet mall are nearby. The base of the Cabriolet lift and the Canyons transit hub are a four-minute walk from the condo. From there, the Cabriolet lift can take you to Canyons Village and the ski lifts, and free city bus service can take you to Deer Valley, historic Main Street, and pretty much everywhere in Park City. In the summer, enjoy a wide range of outdoor activities, including, great golfing, hiking, biking, swimming, fishing, boating, and nature watching. Our covered balcony, which overlooks the 13th tee of the Canyons golf course, has gorgeous views of the Uinta Mountains and a table and chairs for outdoor dining. Our Red Pine condo is our second home. We love Park City and especially the Canyons resort area. The Cabriolet lift to the Canyons village is a four-minute walk from the condo! The condo is located at the base area of the Canyons Village location of Park City, a four-minute walk to Cabriolet Lift to the village and its ski lifts. We overlook the Canyons golf course. Our unit looks across the valley to the Uinta Mountains. Guests can park two vehicles in the adjacent lot. Table and chairs offer outdoor dining. The condo is a four-minute walk to the Cabriolet lift, which takes you up to Canyons Village and the ski lifts. Large pantry and fully equipped kitchen. Skis and boots can be stored in the condo. The clubhouse can be rented for celebrations. The clubhouse has tennis courts, volleyball, heated pools, hot tubs, and sauna. No smoking and no pets. We enjoyed our stay and will book again if we come to Park City in the future. We stayed here for a family ski trip in March 2019 and the location is fabulous. The walk to the Cabriolet lift is even closer than it looks in the pictures making this one of the closest condo locations to the lift. We walked with our two children, everyone wearing ski boots and carrying their own gear, and the walk was fine. There is a short path that connects the parking lot to the sidewalk. No car is needed because the Cabriolet lift runs into the mountain village and actually even in the winter when the lift shut down at night the walk back was an easy 10 minutes. Bus services described in other reviews, taxis and Uber can fill in the need for going into Park City for dinner. The condo is clean and well-maintained with many nice touches and new appliances. Washer and dryer is nice. We had plenty of hot water for showers and good water pressure. The beds all had nice mattresses and bedding and were comfortable. The indoor ski storage area was nice to thaw & dry equipment while keeping it out of the way. We really enjoyed our stay! Very quick and easy walk to the gondolier for The Canyons. Nice, clean, mountain casual condo. Well appointed. Nice patio overlooking the valley north of Park City. 3 mins to I-80, 5 mins into downtown Park City. House is clean, well equipped and cozy. Front unit of the resort, no view blockers at balcony. 5 mins walk to the nearest Cabriolet lift to Caynon village base. ~ 4 miles to cloest Smith's, Wholefoods and liquor store. Fireplace on the first floor is lovely to keep the floor warm. 1st floor bedroom has seperate AC, as well as 2nd floor, those AC are effective and very quiet. Living room area is bit small for 3+ people. Bunk bed is bit low for adults sleeping in lower bed (maybe ok for kids). Comfortable and convenient to cabriolet lift. Plenty of room for everyone to sleep! Clean and great price! A great condo with everything you need. Washer and dryer was a great convenience. I bit dated but had everything you need.